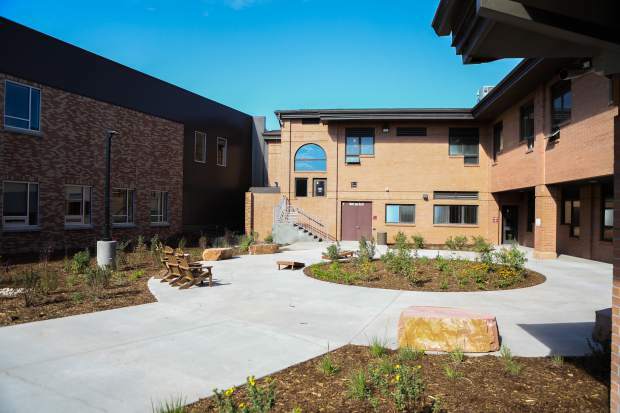 The courtyard provides a campus-like feel in the newly-renovated Eagle Valley High School in Gypsum. Students can study outside, play bags and stroll between buildings. 217: New piles driven for foundations, including one that reaches 100 feet down. The new and renovated buildings include new STEM and career skills programs, new health sciences and athletic training facilities, private counseling and special education spaces, Health Sciences and Hospitality center with a 92-person lecture hall and eight commercial and residential kitchen stations. GYPSUM — You could spend $31 million, but you probably couldn’t spend it any better. Eagle Valley High School celebrated its grand opening with a ribbon cutting and tours — the third new school grand opening in two days. Eagle Valley Elementary and Eagle Valley Middle schools opened Wednesday, Sept. 5. After Thursday’s ribbon cutting, EVHS seniors broke the crowd into manageable bits and led tours. They had led 280 incoming freshmen on similar tours Wednesday, the freshmen’s first day of high school. And as anyone who conducts tours knows, it’s important to engage all the senses of your audience, which might explain why the splendiferous aroma of chocolate cookies wafted from the culinary area, as pulled pork and mac and cheese was served in the cafeteria. Superintendent Carlos Ramirez thanked the teachers, who had to pack, unpack and teach classes in a construction zone. Even the construction phase was educational. While the 217 massive iron pilings were being driven toward bedrock, one of the Pat Sheehy’s music classes broke out a metronome and calculated that the pile driver was hammering the iron pilings at 58 beats per minute. The third ribbon cutting in two days makes it something of a miracle, said Sandy Mutchler, school district chief operating officer. “It’s a testament to the amount of work that has been accomplished in the past year and a half. This week is the culmination of untold amounts of work,” Mutchler said. The maintenance and technology departments worked “endless hours” getting everything ready to go when students reported for class Wednesday. Brandon Hern graduated Eagle Valley High School, and was Haselden’s project manager for the new Eagle Valley buildings and renovation. In fact, when construction was rocking they estimate that more than 400 local tradesmen were working on the school buildings Haselden was working on. Eagle High School in Eagle and Eagle County High in Gypsum consolidated for the 1959-60 school year. The powers that be named it Eagle Valley High School. They voted for everything: mascot, colors, school song … everything. Students adopted the Devils as their mascot not long after 1965 when Joe Hopkins drew a rendition of Freddie Devil, the Harvey Comics character. Eagle Valley students named him Hot Stuff when he appeared on the front of the student newspaper. Hot Stuff caught on quickly and became the school’s mascot. Former Eagle Valley Principal Ivan Kershner is a bit of an artist, and contacted Harvey Comics about possible copyright problems. There weren’t any. The Harvey Comics folks gave the school permission to use the character forever, charging the school something like $2. Some things should not change, among them the boards on the auditorium stage. As you stand facing the audience, the boards skew to the left. One parent walking through Thursday was in one of the original EVHS productions in that auditorium in the 1970s when it was added during a former expansion. He noticed that the leftward lilt to the stage boards has not changed. It inspired a great idea for an EVHS play. “We can call it ‘The Taming of the Skew,” he said. 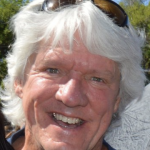 Staff Writer Randy Wyrick can be reached at 970-748-2935 and rwyrick@vaildaily.com.